inscription: Top left reads, "garland kirkpatrick/helvetica jones design." Bottom right includes acknowledgements and bottom left describes the Center for the Study of Political Graphics and the exhibition. Poster has a blue background with white and black text. 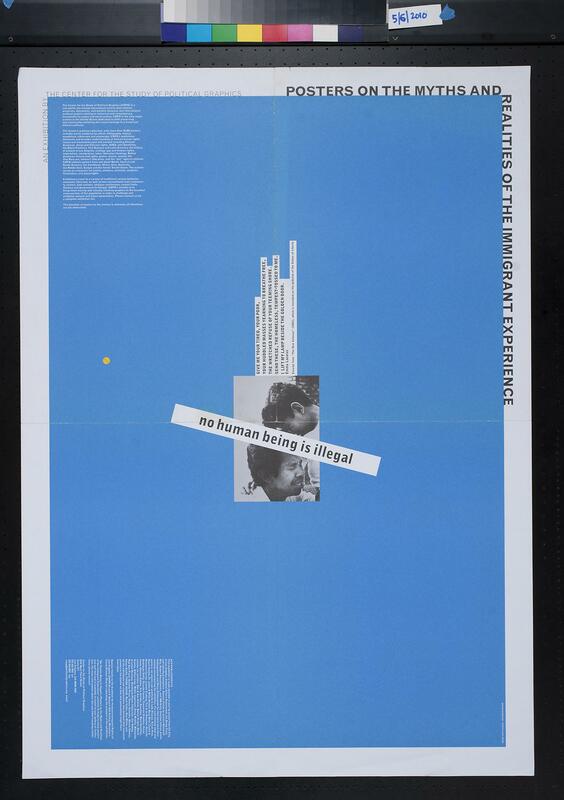 In the center is photograph of two people with the text, "no human being is illegal," across the image. Extending from the image is an, "excerpt from "The New Colossus" (1883), which is inscribed on the pedestal of the Statue of Liberty." The quote is," Give me your tired, your poor, your huddled masses yearning to breathe free, the wretched refuse of your teeming shore. Send these, the homeless, tempest-tossed to me. I lift my lamp beside the golden door." - Emma Lazarus. Poster reads, "Posters on the Myths and Realties of the Immigran Experience/ An Exhibition by The Center for the Study of Political Graphics." Verso has a message from the Executive Director and 17 examples of posters.